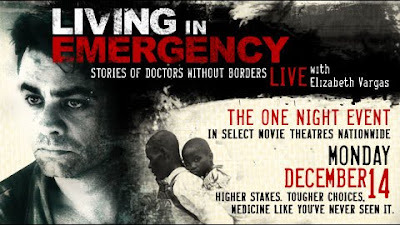 Coming up next Monday, December 14, a national simulcast of the Oscar-shortlisted documentary film "Living in Emergency: Stories of Doctors Without Borders." There's a screening and panel discussion in NYC that night, and the whole megillah will be simulcast in nearly 450 theaters around the country. For locations and tickets, click HERE. The organization "Doctors Without Borders" (or MSF, by its French initials) remains impartial in providing medical care -- they provide care based on need, and not on political affiliation. That sounds relatively uncontroversial, except when you consider that they're operating in countries at war, and with murderous rebels or government officials whom many people would consider indefensible. How do you treat a rebel army troop who, say, is willingly disrupting life in a refugee camp? And more to the point of this blog, how does the filmmaker remain neutral in treating these various issues? Is neutrality a cop-out in situations where one or another party may be "obviously" in the right, or another in the wrong? You can ask these and other questions if you attend the simulcast this Monday, December 14. Also, stay tuned for an "Inside Stories" podcast episode about the film, in which I speak with the film's director and with the organization's communications director about making the film, and how they hope the risky strategy of this one-night event will benefit the organization. I'll go to the film screening, and have a podcast for you this month or next. If you go to the simulcast in your home county and city, please let me know what you think. I'm really looking forward to hearing your report on the film. I am enjoying your blog very much.